[20/3/08] Negotiations on the future of the Farmers Market are still going on. Who runs the market remains a particular point of disagreement. Watchdog continues to support Bath Farmer's Market Ltd as the management company. [14/2/08] We received a report that work was taking place on the barrier by the disabled parking spaces in Green Park Station. The obstructive barrier that was so much of a hazard to the disabled has now been removed and individual barriers have been installed behind each car space. [3/2/08] Someone who regularly walks through Green Park Station has reported that some of the weekday traders (as opposed to the Farmer's Market) are not there as often as they used to be. Clearly the Sainsbury's policy of banning trader's parking is having its effect. Watchdog spoke to one trader who confirmed that now that he has to take the cost of parking into account, he doesn't see the point in setting up his stall on days when he expects trade to be slow. Those who shop at such stalls are now finding it a bit hit-and-miss whether their trader is there on the weekday they look for them. If this carries on, the weekday market will die. So continue to badger Envolve to sort the problem out. Envolve agreed to let the status quo for the Farmer's Market continue at least until after Christmas. Whilst that removed the risk of any action being taken which could endanger the busiest time of the year for the traders and the most important time of the year for their customers, in the long term nothing has changed. According to press reports, Envolve are still intent on taking over the management of the market "by next Spring" and the traders are still determined that they will not let that happen. So the threat to the market is only postponed, not removed altogether. If you have not already familiar with the situation, read on. If you haven't already registered your opposition to the plans, please do so (see What You Can Do below). Meanwhile, as from the beginning of December, Sainsbury's have withdrawn their dispensation that allows traders (not just the Farmers Market, but also the Envolve traders as well) to park in the Sainsbury's car park for an unlimited time. Now they will be forced to move their vehicles within the permitted 90 minutes or risk a penalty. This is bad news for all traders, because they will have to arrange cover to watch over their stock to prevent it being stolen while they move their van elsewhere (and so far no alternative convenient long term parking has been found). This is particularly bad news for traders who have bulky goods or a high turnover, because they will no longer be able to keep reserve stock in their van and replenish. It also means that when they want to pack up and leave, there is no guarantee that they will be able to bring their van to a convenient place to load, because all the nearby spaces might be occupied by shopper's cars. An emergency meeting with Sainsbury's, Envolve and the Farmers Market managed to secure a dispensation for Saturdays only, and for the Farmers Market only, to allow unlimited parking in the Homebase car park. This brings its own complications in that stallholders will have problems bringing their vans close enough to load up unsold stock at the end of trading if all the nearby parking spaces are occupied by shoppers' cars. And for all the other traders who are there, and on other days of the week, there is no restoration of the previous parking dispensation, and no all-day parking provision offered. A sample straw poll by Watchdog revealed that several of them are seriously considering giving up their pitch because of this. So if you believe that the stallholders and shop units add value to Green Park, then you should protest. This is mainly Envolve's responsibility, because they lease the area for the traders from Sainsbury's. But you can help by pestering Envolve to negotiate a re-think by Sainsbury's. Contact details for Envolve are in What You Can Do below. You can also put pressure on Sainsbury's yourself. When you are in the store, ask to see the manager and complain about the decision. If he blames someone else in the Sainsbury's organisation, ask for a name and address, and complain to them too. Also consider hitting them where it hurts - in the tills. Buy a few things (or even all your shopping if you are so inclined) that you would have got from Sainsbury's from somewhere else, and write to them (at the address below) and let them know you will continue doing that until they change their mind. Remember - they need you as a customer more than you need them as a shop. You could also point out that the traders attract customers that are then likely to use the store, so if they drive the traders away, it will affect their customer numbers. Ten Years ago, Britain's first ever Farmers Market took place in Bath. The objective was to bring good quality fresh produce direct from local producers to the customers. The idea was to expand the customer base for organic farmers and other local non-organic sources, while allowing customers to buy fresh products that have covered the minimum amount of "Food Miles". Other parts of the country followed Bath's example, though many with less success. If you visit such markets, the style varies a lot. Some only sell meat; some specialise in prepared local foods like cakes and pastries; some are primarily fruit and vegetables. Sometimes you see the same seller in different towns, trucking their goods to this market on Tuesdays, the next on Wednesdays and so on. Few other markets operate weekly now; fortnightly being the most common. But Bath's market has stuck to its principles, thanks mainly to the management company that the original traders set up from among their numbers. Bath Farmer's Market Ltd rents space at Green Park from Envolve, and allocates pitches within that space to individual stallholders, aiming for a good balance of produce, well presented, with sufficient room for customers to circulate around them. The market continues to be local (mostly organic) farmers selling direct to the public, and it has sufficient regular trade to continue to operate weekly. In business terms, it is a success. Envolve rent out individual stall spaces along the side of the Green Park train shed, and have control over which traders use those stalls on what days, but have a "block booking" arrangement with Bath Farmers Market Ltd for the timbered section in the centre of the train shed, and Bath Farmers Market Ltd has a single manager to control which traders occupy it on Saturdays. 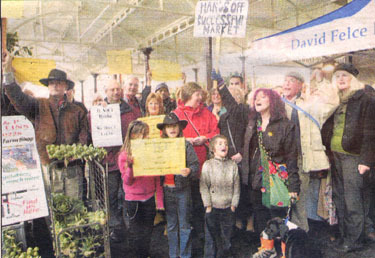 Envolve have given notice to Bath Farmers Market Ltd to quit the space that they normally rent by 17th November. They have justified this using the usual drivel: it could be more vibrant; it is not reaching its full potential; it is not sustainable. Any regular customer will tell you that this is a pack of lies. After all, Britain's longest running and most frequent Farmers' Market can't be doing too much wrong! At the same time, Envolve want to set up a market Management Board consisting of customers, stallholders and local councillors to run the market for Envolve, and want the existing individual stallholders to enter into individual rental agreements with this Management Board, whilst looking for additional traders so that the market can be expanded. The new arrangements were to operate from 23rd November. It doesn't take a genius to read between the lines and work out that with direct control over each stall they can tout for the highest rent for each pitch to maximise the income for Envolve regardless of the mix of traders that results, and regardless of customer demand for any particular produce. It might also be convenient for a council which has plans for developing the Green Park site to only have to deal with Envolve, so is anybody pulling strings, we wonder? Much to Envolve's surprise, the individual stall holders have rejected Envolve's approaches, informing them that they would rather follow Bath Farmers Market Ltd to another location for the market than give in to Envolve's take-over bid. Watchdog's quick straw poll round the traders that do currently rent directly from Envolve revealed that if the farmers went somewhere else, many of them would go there too, because the farmers' customers are their customers. Also to Envolve's surprise, the customers themselves have organised themselves into a "Leave our market alone" protest group, and on the morning of 10th November, before the meeting Envolve set up to discuss the new arrangements with the traders, a group of protesters, the press and TV cameras all turned up to record the strength of feeling. 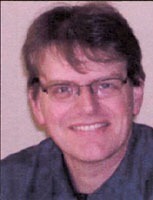 A petition against the plans secured over 2,000 signatures in two weeks. At the meeting following the demonstration, Chris Head, on behalf of Envolve, agreed to extend the date of the notice to quit, initially by two weeks to December 2, with an option to extend it further. Both Traders and the customer protest group say that this is not good enough. It puts the risk of disrupting the market into the most profitable time of the year for the traders, and puts the customers' plans for buying their Christmas produce at risk because they can't guarantee that the market traders that they want to use will be there on the days they want to buy. They want the proposal withdrawn completely. The best way to help the market traders is to go along and buy their products regularly, and if they are forced to move, to follow them to their new location.